The original hydrogel lenses were designed from hydroxyethyl methacrylate (HEMA) at the Czechoslovak Academy of Sciences in 1952.Yet when Bausch and Lomb released their Pure Vision lens made of silicon hydrogel in 1998, the optical world witnessed a true innovation in contact lens comfort. 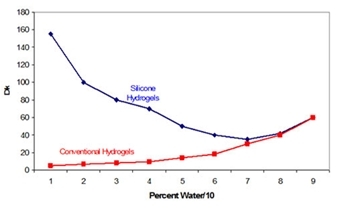 Silicon hydrogel lenses transmit 6-7 times as much O2 as traditional soft hydrogel lenses. The clinical and visual health benefits of significantly greater permeability include decreased swelling of the cornea (edema) and fewer problems with corneal dryness as well as the potential for longer wear. Some silicone hydrogel contacts, known as continuous wear lenses, are worn for an entire month without the need to remove them at all. How Do Silicone Hydrogel Lenses Work? The hydrogel polymers in regular soft contact lenses work by using water as a transport mechanism for oxygen to the surface of the eye. The water carries oxygen that allows the eye to breathe, even when covered by contact lenses. However, the amount of oxygen the eye receives is restricted by the amount of water in the lens. Since silicone can be permeated by oxygen, hydrogel lenses made with silicone can carry oxygen to the eye both by using the water as transporter and directly via the silicon molecules they contain. What Are the Advantages of Silicone Hydrogel Lenses? The main advantage of silicone hydrogel lenses is that they allow for the return of 30-day wear. Since silicone hydrogel lenses carry so much more oxygen, up to seven times more than conventional soft contact lenses, wearers can keep the lenses in for up to a month with limited danger of infection or other damage to the eye. Since the lenses require less water, they are less likely to suffer from dehydration, resulting in more comfort for the wearer. What Else Should I Know About Silicone Hydrogel Lenses? Patients who prefer to sleep in their lenses are particularly suited for wearing silicone hydrogel lenses. However, not all silicone hydrogel lenses are 30-day wear lenses. Other types of silicone hydrogels may be weekly replacement lenses or even daily wear lenses. In addition, silicone hydrogel lenses may require special order, since not all brands carry lenses made of this material. Consult your eye care specialist before trying silicone hydrogel lenses and inform him of your specific needs with regard to overnight or extended wear contact lenses. He will be able to help you determine if silicone hydrogel lenses are the healthiest and most convenient alternative in lens wear for you.